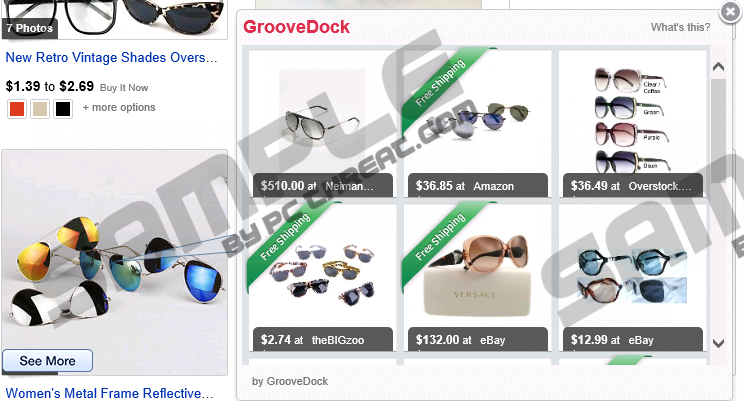 GrooveDock is a browser add-on that provides the user with special offers, coupons and different advertisements in order to make the experience on the Internet more pleasurable. However, the application is also categorized as adware, and if you have just installed this application, soon you may decide to remove it from the computer. The application works on Internet Explorer, Mozilla Firefox and Google Chrome. It is available on its official websites, whose design is very similar to the websites promoting LinkiDoo, OutoBox, JumpFlip and some other programs. GrooveDock may also be bundled with other programs, which means that you should be very attentive then installing various free programs. Always read the license agreement and other information provided by the installation wizard because this is how you can prevent unwanted additional programs. Once installed, GrooveDock starts to generate various advertisements, including web-banners, in-line advertisements and different pop-ups. The content of the advertisements is not controlled by GrooveDock and it is not responsible of the accuracy or pricing errors. Moreover, GrooveDock does not take responsibility for the content of the websites. You use the application, i.e., click on the advertisements at your own risk, and if you want to reduce the risk of being directed to insecure websites, you should remove GrooveDock from the computer. When you find that the advertisements are not related to your interests, it does not mean that you are not being monitored. GrooveDock can monitor your browsing behavior for marketing and advertising purposes. It records your search terms, the URLs of the websites you visit, your clicks and some technical details of your operating system and Internet browsers. Having determined what you are mostly interested in, the developers of the browser add-on may attempt to provide you with specific advertisements at a particular moment in order to attract your attention. The same tactics may be used by the websites promoted by GrooveDock, and if you want to bring an end to it, remove GrooveDock from the computer right now. If you are determined to remove GrooveDock from the computer manually, the instructions below may help you to do, but you should also bear in mind that you should scan the computer afterwards. If you want to have GrooveDock removed from you, implement a spyware removal tool. In this way you will also protect the system against dangerous computer threats, which can easily access unprotected computers. Our team recommends using SpyHunter because this application can easily remove GrooveDock and save your time by running automatic system scans. Move the mouse to the lower-right corner of the screen. Do not forget to scan the computer once you remove the unwanted application because you want to be sure that no components of the adware program are left within the system. Quick & tested solution for GrooveDock removal.